While the Sensex closed 111 points lower to 36,050, Nifty closed 16 points lower at 11,069 level. ICICI Bank (1.60%), Coal India (1.56%) and Kotak Mahindra Bank (0.99%) were the top gainers on Sensex. 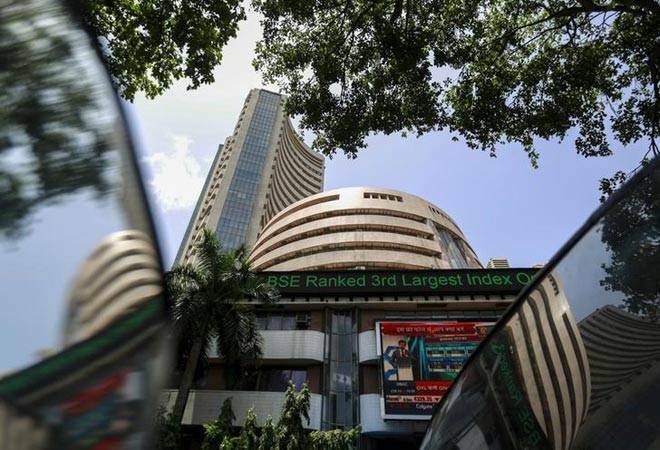 The Sensex and Nifty snapped their six-day gaining streak and closed lower in volatile trade on derivatives expiry for January. While the Sensex closed 111 points lower to 36,050, Nifty closed 16 points lower at 11,069 level. ICICI Bank (1.60%), Coal India (1.56%) and Kotak Mahindra Bank (0.99%) were the top gainers on Sensex. State-run lender SBI (4.96%) was the top Sensex loser a day after the government moved proposal to infuse additional grant of Rs 88,139 crore - Rs 80,000 crore through Recap Bonds and Rs 8,139 crore as budgetary support - for 2018 under the public sector banks recapitalisation plan. Large state-run lenders slid as they stood to receive less money than expected from a government recapitalisation plan. Other major Sensex losers were Adani Ports (2.37%) and Dr Reddy's (2.26%). Market breadth was negative with 1702 stocks closing lower against 1145 rising on BSE. 165 stocks were unchanged. Midcaps and small cap stocks indexes on BSE were the top losers falling 134 points and 132 points, respectively. Bank Nifty recovered 300 points from day's lows to close 47 points higher at 27,445. The index earlier hit a lifetime high of 27,522 level. BSE auto index was the top loser among 19 sectoral indexes falling 305 points to 25,670 level. Overall sentiment was cautious as investors awaited the annual budget for the fiscal year starting in April to be unveiled on February 1. Expiry of monthly derivative contracts at the end of the session, after indexes hit record highs in each of the six previous sessions, also kept sentiment in check. "Markets are usually volatile on the settlement date for futures and options contracts. Now, markets are waiting for the annual budget," said R.K. Gupta, managing director at Taurus Asset Management. Investors booked profits in IT stocks, with the Nifty IT index slipping 1.9 percent after gaining in the last seven sessions. Infosys Ltd fell 2 percent while Tata Consultancy Services Ltd slid 2.2 percent. Meanwhile, Biocon Ltd fell as much as 5.4 percent after posting a 46 percent drop in third-quarter profit.